just fews hours after reports surfaced that Burlington online store also cut ties with the Ivanka Trump's brand. 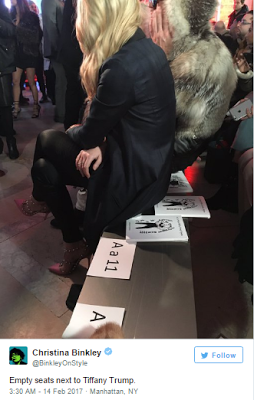 Tiffany faced discrimination at the Paris Fashiin Week where she was left to sit by herself the front row. 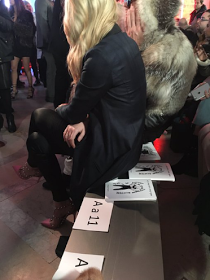 Asides the fact that no one wanted to sit with her, two fashion editors who were placed close to her, reportedly left their seat for a different one, just to avoid being beside her. Christina Binkley, a fashion writer, shared the story on Twitter and a lot of people came to Tiffany's defense. Philipp Plein, the designer who threw the show, also came to Tiffany's defense and said what was done to Tifanny was hateful and disrespectful. “Tiffany Trump is not a politician, she’s a teenager,” Philipp Plein told TMZ. “Can you blame a daughter for having a father who has the wrong political direction for some people?